Das CDM-VW300 ist ein zweikanaliges Interface zwischen Sensor und Datenlogger, das kürzere Abstände zwischen den Messungen ermöglicht. Das Interface reduziert das Rauschen, das häufig bei Schwingsaitensensoren auftritt. Es ermöglicht es, dass das Signal durch längere Kabel dringt und damit mehr Flexibilität bei der Aufstellung von Sensoren und Datenloggern. Das CDM-VW300 kann mit Standard-Schwingsaitensensoren verwendet werden und ermöglicht schnellere und genauere Messungen ohne dass neue Sensoren gekauft werden müssen. Mehrere CDM-VW300s können an einem Logger angeschlossen werden. Das CDM-VW305 ist ein ähnliches Modul mit 8 Kanälen. Diese Module nutzen die patentierte Schwingsaiten-spektralanalysetechnik (VSPECT) um die Resonanzfrequenz der Schwingsaite zwischen den Anregungen zu bestimmen. Dadurch ergibt sich eine sehr feine Auflösung während externe Störungen weniger Einfluss haben. Es kann zwischen Signal und Rauschen aufgrund des Frequenzanteils unterschieden werden. In addition to the dynamic vibrating wire measurement, the CDM-VW300 makes several auxiliary measurements. 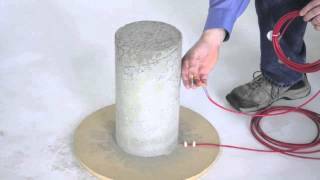 A static vibrating wire measurement is made once each second, along with the dynamic measurements, which provides finer measurement resolution and greater immunity to external noise sources. The CDM-VW300 includes a thermistor input channel paired with each vibrating wire channel, featuring high-precision 24 bit measurements at a 1 Hz rate. Lastly, a rich set of diagnostic parameters is provided with the vibrating wire data. The CDM-VW300 has the capability to simplify post-processing of data by computing common values internally. Vibrating wire data can be reported as measured frequency or as the frequency squared with a multiplier and offset applied. The thermistor data is reported as resistance or is converted to degrees Celsius using the thermistor’s Steinhart-Hart coefficients. The CDM-VW300 also can internally compile rainflow histograms from the final data and report the values at user-specified intervals. The SC-CPI Datalogger Serial-to-CPI Interface is required to connect the CDM-VW300 to a compatible data logger (except the CR6). A 5-conductor cable connects the data logger to the SC-CPI, and an Ethernet cable connects the SC-CPI to the CDM-VW300. The CDM-VW300 is not designed to work with multiplexers. CRBasic program examples for use with the CDM-VW300 and CDM-VW305. DVW Tool Box is an application-specific software tool for demonstration and evaluation of the CDM-VW300 and CDM-VW305 dynamic vibrating-wire interfaces. What is the difference between the CDM-VW300 and the CDM-VW305? The CDM-VW300 offers two channels for simultaneous reading of two vibrating-wire sensors, whereas the CDM-VW305 offers eight channels for simultaneous measurements. Other than the number of channels supported, both models operate identically. What kind of vibrating-wire sensors will work with the CDM-VW300 or CDM-VW305? These devices work with vibrating-wire strain gages, load cells, pressure transducers, crackmeters, and tiltmeters. Any standard, single-coil circuit vibrating-wire sensor should work with these devices. How can the frequency of the vibrating-wire sensor be converted to engineering units of measure? The frequency outputs generated by the CDM-VW300 or CDM-VW305 can be scaled with known sensor response functions, which are provided by the manufacturer of the sensor. These frequency conversions are used to obtain measurement outputs expressed in the desired engineering units. Can more than one CDM-VW300-series device be used with one datalogger? Yes. 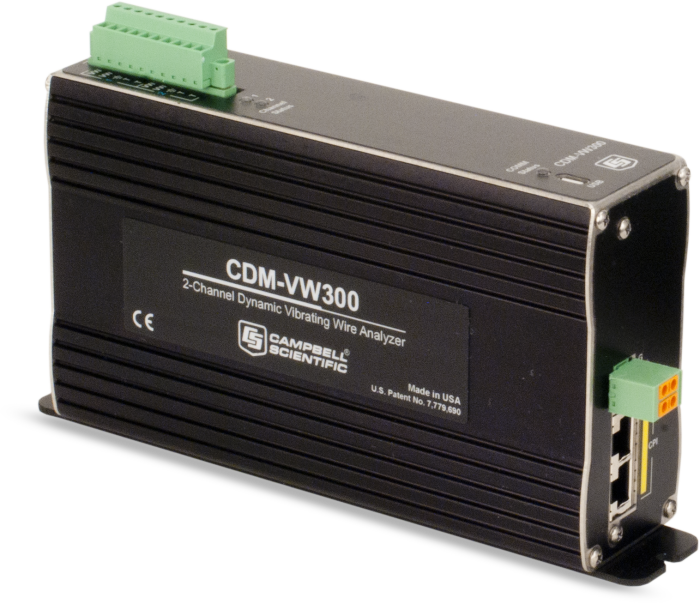 When more than eight channels are needed in a system, multiple CDM-VW300-series devices can be connected to the same data logger. Each CDM-VW300 device provides two terminals. Each CDM-VW305 device provides eight terminals. Any combination of CDM-VW300 and CDM-VW305 devices can be used to achieve the desired number of total terminals. What hardware is needed to make a CDM-VW300 or a CDM-VW305 work? To communicate with CDM devices using the CPI protocol, the CR3000, CR1000, CR850, and CR800 dataloggers require an SC-CPI device. Only one SC-CPI device per datalogger is required. It is expected that the design of future Campbell Scientific datalogger products will work with CPI-based modules directly. What is the CPI bus? The communications protocol used by CDM devices is the CAN Peripheral Interface (CPI), which includes methods that are proprietary to Campbell Scientific. Yes. Specific types of sensor measurements can be examined and evaluated before the system is deployed to a field site. A data logger is not used for this type of evaluation. Connect the CDM-VW300-series device directly to a computer using a USB cable. Using DVWTool software (specialized software included with the CDM-VW300 or CDM-VW305), the outputs of the attached vibrating-wire sensors can be observed, and the CDM device can be configured appropriately. CDM-VW300-series devices can measure vibrating-wire sensors at the following rates: 1 Hz, 20Hz, 50Hz, 100Hz, 200Hz, and 333.3 Hz. CDM-VW300-series devices are designed for measurement periods of 1 s or less.